The windshield wipers of your car have a vital role to play; they keep dirt and grime off the glass and increase your visibility through the cabin. However, like any other component of your vehicle, the wiper blades deteriorate with constant use. You should get them checked once every year to make sure they are in good condition and are functioning correctly. If you live in the neighbourhood of Easington, Saltburn-by-the-Sea, or Cleveland, you can bring your vehicle to us. We are Easington Service Station, one of the largest car service garages in that area. You will find windscreen wipers for a wide range of different make and model of vehicle at our workshop. 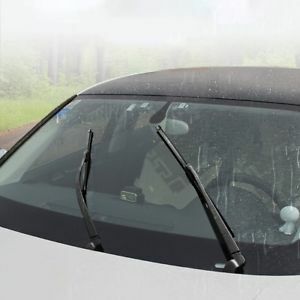 Wipers work like a mop, collecting and removing raindrops and dust from your car’s windshield. Unfortunately, prolonged exposure to the outside atmosphere makes them rigid, and they lose their functionality. You will notice specific issues when the wipers start to harden. Noise when moving across the windshield–If the rubber is hard, you will hear a screeching sound whenever your car's wipers are in operation. That is because the harder material keeps scratching against the glass. You should come to our garage for wiper blades replacement in Easington as soon as you notice this issue. Also, if the rubber is hardened and moving against your glass pane, you will notice scratch marks developing on the glass. It can decrease your visibility over time. The windshield is not being cleaned correctly – Old and deteriorated wiper blades will not be able to clean a windscreen Water and dirt will stay on the glass, especially on the top and bottom parts of the screen. You will also notice that these wipers are not moving across the glass properly, they will vibrate and stop while working. Tiny cracks all across the body – Probably one of the most significant sign is small cracks all over the length of the wiper blade. It happens due to the hardened rubber. You can visit our Easington Service Station and get a pair of new wiper blades if you notice this condition. At our garage, you will find a wide range of replacement wiper blades. We stock standard rounded edged wipers, flat style wipers, rear wipers, and even spoiler wiper blades. All our products are available at affordable rates, and if you find fitting these new blades fiddly and complicated, we will happily do that for you. Visit us today; we are open from Monday to Friday, 8:30 AM till 5 PM. On Saturdays, we are open till 2 PM.